I am absolutely head over heels for mirrored furniture. 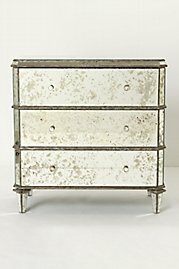 This dresser reminds me of my trip to Versailles, where there were entire rooms of mirrored pieces alongside rich fabrics and beautiful crystal chandeliers. I love how this very opulent piece has been turned a bit shabby chic similar to Mercury glass. And while I would love to have two of them to use as bedside tables, the very NOT low price of $1298 means they will probably remain more of a covet than a probable purchase.